My introduction to the works of Roddy Doyle came from Father Ted, during a brief (and very funny) scene referencing “those Roddy Doyle books”. Having since read much of The Commitments and learnt more about Doyle, my knowledge of what The Commitments show would provide had therefore obviously increased. 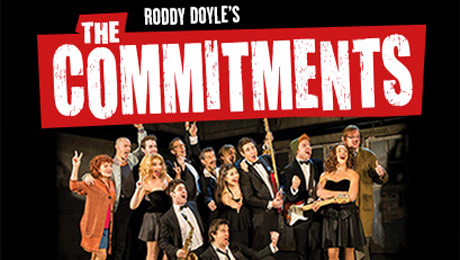 The Commitments tells the story of what Jimmy (Andrew Linnie) describes as “the hardest-working band in Ireland”. Beginning as an ambitious trio, the group hold unsuccessful auditions to try and increase both their numbers and the talent involved, before some chance meetings with vocalists and instrumentalists soon leads to the band – quickly named The Commitments – growing in size. As they become familiar with each other and emphasise their desired focus on soul music, an opportunity comes up to perform on a night where there would normally be bingo. This acts as a big break of sorts, since the band starts building up its fame and interest, from fans and promoters. A series of challenges arise which threaten the status quo of the group, so it remains to be seen as to whether or not The Commitments will even stay together long enough to ultimately achieve their musical dreams. The soundtrack for the show includes some classic soul numbers like Proud Mary; Midnight Hour; I’ll Be There; Signed, Sealed, Delivered (I’m Yours); and, perhaps most famously, Mustang Sally. These and several other famous tunes are performed throughout the show, and the vocal performances across the board are very, very good. Brian Gilligan is outstanding as Deco; he is entirely believable as the arrogant feature singer who is resented by his bandmates but is a vital piece of the Commitments puzzle, and his solo renditions of these great songs reminded me of the leading performers in the ever-brilliant Jersey Boys show. The three female singers – Amy Penston as Natalie, Christina Tedders as Bernie and Leah Penston as Imelda – are also all very talented, providing perfect back-up for Deco and having their own moments to shine during certain numbers. The remaining performers are well-cast, particularly Andrew Linnie as Commitments front-man Jimmy and Kevin Kennedy as Jimmy’s outspoken father, the latter delivering some of the show’s most amusing lines. On that subject: much of the comedy relied on swearing and/or Irish slang, with some moments of physical humour thrown in here and there. Whether this is something that you will find funny depends on your comedic tastes: for instance, you may not understand the Irish colloquialisms, or you may not appreciate the frequent (and occasionally unnecessary) swearing, or you may not like the occasional lambasting of religion and Catholicism. Similar to the way that a Scouse-based show may not be completely appealing across all parts of the country unless it has some strong comedic material in its own right, this is a show which will no doubt find its greatest appeal in Ireland, but could be considered hit-and-miss in other parts of the UK. In addition, I felt that the show was a slow starter from the standpoint of creating humour, perhaps only really starting to shine towards the end of the first half. And whilst the second half was definitely stronger, the ending (which I won’t spoil here) felt a bit abrupt, and is different to the ending of its more famous novel and film adaptation, with some potentially critical material left out of the musical. Therefore, if you are familiar with other versions of The Commitments, you may find the conclusion to be confusing and perhaps a little disappointing, since it feels like one comes away with unanswered questions when all is said and done. It’s a shame because, as noted, there are some excellent musical moments here; when the show focuses on the singing, it is as good as anything that you will see (or, more accurately, hear) in a theatre setting, and other aspects (such as the stage directions and the various backgrounds, such as Jimmy’s home and the local pub) are well-thought out and ultimately serve a good purpose. However, the story and the comedy, which are usually key elements of any great show and two vital components of the original Commitments novel, are not as strong as they should be, which means that whilst one can definitely enjoy this musical, I would not suggest that this was one of the better shows that you are likely to see in 2017. To conclude, The Commitments is an enjoyable show and features some stunning vocal performances, but had the comedic material and the story been stronger, or at the very least its conclusion, this could have been included within the category of “highly recommended”.